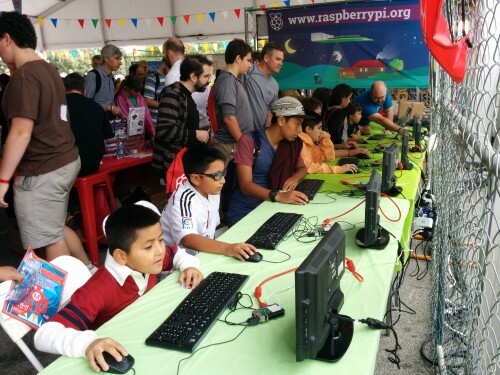 If you can believe it, it’s been four years since Raspberry Pi’s first appearance at World Maker Faire New York in Queens. These days, when we go to Maker Faire, we aren’t only introducing people to Raspberry Pi for the first time. We also want to show something new to those of you who know us well. And at this year’s event, we had a lot of shiny new gear to show off. The Maker Faire booth crew (L-R) Roger, Matt, Eben, Philip, Russell, Rachel, and Ben. Since the new touch display and Sense HAT just started shipping, it was only fitting that we brought along some demos. We had a Kivy-based multitouch demo to show off the new touch display. There was also a quick demo of the functions of the Sense HAT. For those that wanted to get more hands on with Raspberry Pi and the Sense HAT, we had workstations setup for creating animations with Sense HAT’s 8×8 RGB LED Matrix. We owe a huge thanks to Raspberry Pi Certified Educator Richard Hayler for his work on RPi_8x8GridDraw, which we forked for Maker Faire. Maker Faire attendees using Raspberry Pis to program animations onto the new Sense HAT. Maker Faire was also an excellent opportunity to share The MagPi in print with our fans. We have a great new subscription offer for the US, but we also wanted attendees to know that they can now find the official Raspberry Pi community magazine on the shelves at Barnes & Noble and Micro Center across the United States. Watch MAKE’s Vine “Watch the @Raspberry_Pi kinetic art in action, Zone 1 #WMF15 @makerfaire” taken on 26 September 2015. It has 12 likes. Vine is the best way to see and share life in motion. Create short, beautiful, looping videos in a simple and fun way for your friends and family to see. Read more about Sam Blanchard and team’s SeeMore here. Thanks to everyone who came by to see us! See you next year, New York! 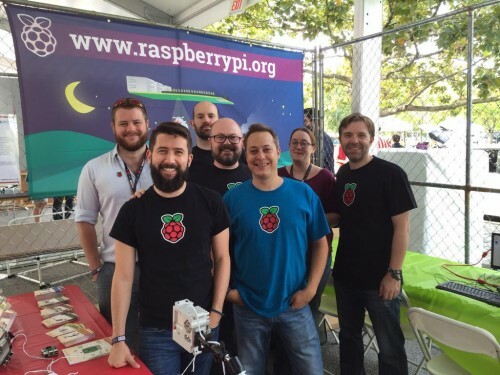 I’m so old I can remember when I went to the information booth at NY Maker faire to ask where the Raspberry Pi people were, and they would respond with “huh?” And each time I asked, I was sent in a different direction. When I finally found Liz, they were looking for a piece of plywood to put on blocks to build a table to run demos. I guess that was real life Minecraft style construction. Now we can’t see the plywood under the fancy table cloths. It all feels as if it was a VERY LONG TIME AGO, doesn’t it? I’m impressed with the growth in Matt’s beard; Matt, what kind of fertilizer do you use? 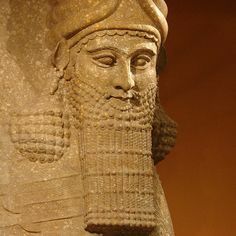 I still think you should be going for the Sennacherib look. sigh – maybe we’ll have a booth next year. Way to go Team Pi de Raspberrie! Looking forward to replicating the excitement on the first weekend of “Movember”! Eben seems to have joined us on Team Movembeard, I see …. Welcome aboard, Matey! We’re all soundin’ like a bunch o’ Cornwall customer support phone center ladies around here waitin’ fer Talk Like A Pirate Day that month, which is every day for us … Arrrr-begarrrrhhhh!!! ? Looks like my sons didn’t make the picture! They were sitting there for about an hour until I kicked them off. I also saw the touch screen for the first time. It was very responsive – I was surprised. It was very nice meeting Eben and all the others. I didn’t see Liz. We were there from 9:30 am until close to closing. Sadly, I wasn’t able to make it this year; I came down with a bug at a crucial moment. Come by next year – I should be there then! That’s ok we’re immune to everything. Hope you got better quick. Meet us at the Faire! We're excited to bring our professional development program stateside!